Dr. Walter Rutledge, WKU Professor of English, annually brings his English 300 class to the Kentucky Building for an introduction to manuscript collections held by Library Special Collections. Afterwards, the students select a collection to read and then write a summary related to it. The following is Cameron Fontes’ paper. He chose to write about the Mansard Hotel register from the collection (SC 1236). 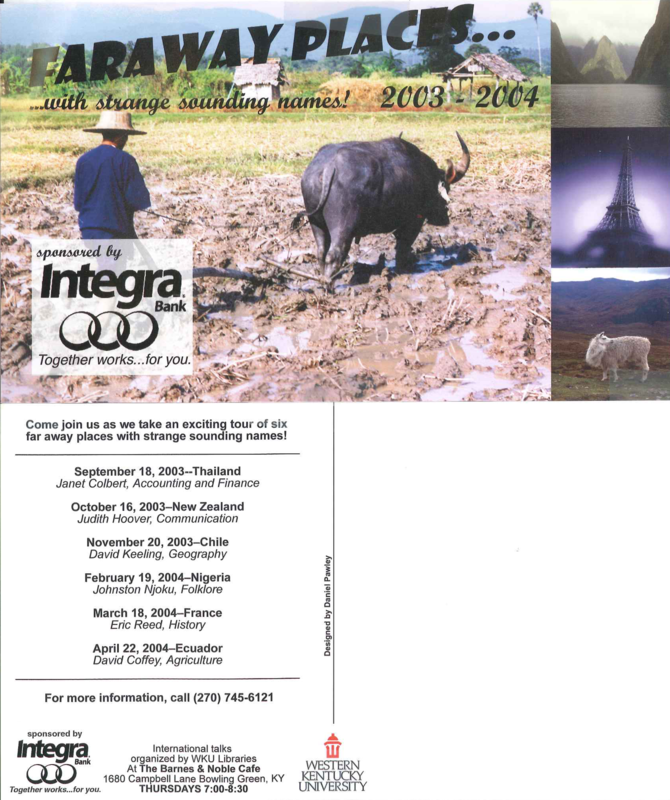 To see the finding aid for this collection click here. Bowling Green’s Mansard Hotel. This postcard is from the Kentucky Library Research Collection, Library Special Collections, WKU. Unlike the many impersonal, chain-owned hotels of today, the Mansard Hotel in Bowling Green, KY, encapsulated all the best parts of its community. It was a locally-owned, well-kept institution where local leaders and travelers alike commingled amidst luxurious, yet affordable, furnishings and convenient eateries. When guests arrived at The Mansard, either for just a meal or for an overnight stay, they recorded the details of their visit on the tall, lined pages of the hotel register in grand, gorgeous script. 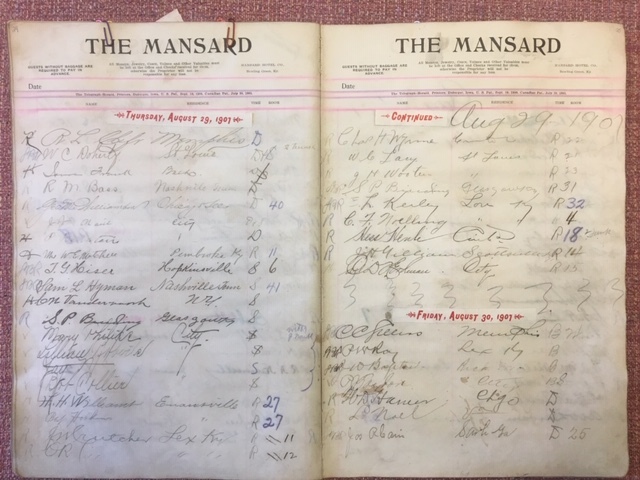 Although it is now yellowed and musty with age, he Mansard Hotel register kept from 16 August 1907 to 7 October 1907, provides an intimate and detailed portrait of the bustling environment of a small-town hotel in the first decade of the twentieth century. The Mansard Hotel ledger (SC 1236), Manuscripts, Library Special Collections, WKU. Located behind what was then the local opera house, the Mansard stood near the corner of Main and Center Streets in downtown Bowling Green. At check-in, one of the register columns guests were required to fill out if they were staying overnight was the “Room” column, in which they were to write their room number as well as the number of pieces of luggage they brought with them. 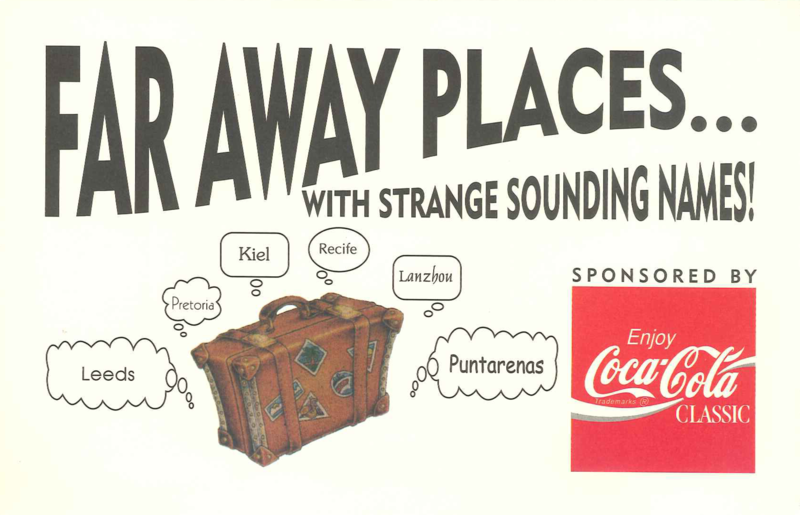 Although the number of pieces each guest brought with them is nothing especially noteworthy, one interesting observation that can be made upon reading the record of each guest’s luggage is that for the most part, guests only used trunks rather than suitcases, which are probably the most common type of luggage in use today. On 7 September 1907, a guest who signed as “E. Jenkins” from Buffalo, New York, brought with them one trunk and stayed in room seven. Buffalo was only one of a plethora of places from which guests at the Mansard traveled. Each guest wrote their place of origin in the register column marked “Residence,” their responses ranging from various towns within Kentucky, such as Golden Pond and Louisville, to St. Louis, Missouri, Evansville, Indiana, and many cities besides. 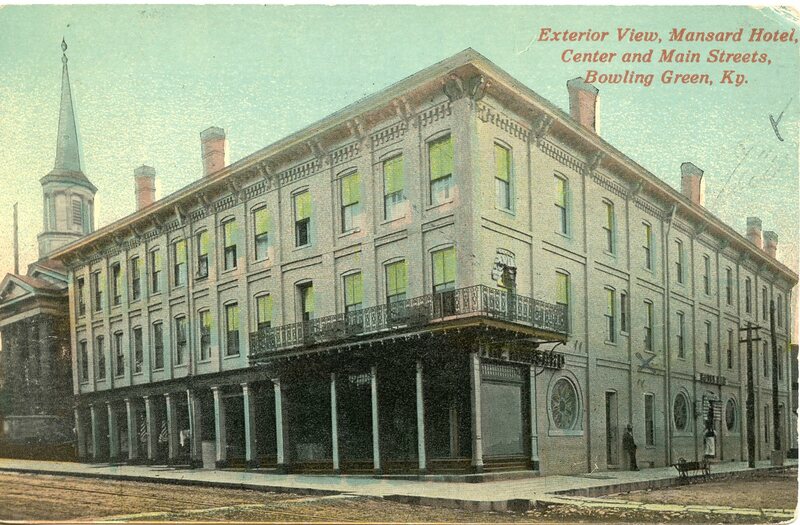 If a guest were visiting simply to take in a meal at the hotel restaurant, they wrote “City” to indicate that they were a resident of Bowling Green. One especially fascinating entry in this column on 24 September 1907, is that of Ed H. Foster, who signed that he was from “Coffeetown,” a small town in Pennsylvania located, funnily enough, about five miles from the town of Hershey. It is evident which guests in the register were only visiting for a meal by whether or not they write a room number in the “Room” column next to their response in the “Time” column. Obviously, if there was a room number in this column, that was the room in which the guest who signed on that line stayed. If there was no room number, however, one has only to look at the guest’s response in the “Time” column to see for which meal they made a trip to the Mansard. Each guest signed either a “B,” “D,” “S,” or “R”. Most likely, the first three letters indicated the meal at which each guest dined or the closest meal to which each guest checked in for their stay, “B” being for “Breakfast,” “D” for “Dinner,” and “S” for “Supper.” “R” would likely have stood for “Resident,” seeing as how the demographic of permanent residents of hotels was much more common in 1907 than today. One very famous Bowling Green resident who visited the Mansard for breakfast om 2 September 1907, was none other than Henry Hardin Cherry. Western Kentucky University’s first president, Cherry signed his name in big, beautiful cursive along with the name of his beloved hometown, making sure to proudly write out “Bowling Green, KY,” instead of simply “City,” as so many others had done. That he would have been well-respected and well-known at the time is likely. Having just become the president of what was then “Western Kentucky State Normal School” the year before, he would have already been considered a bastion of higher education in the community. Other notable guests at the Mansard during this time included C.W. 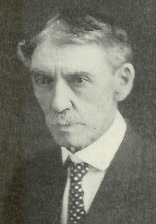 McElroy, a state representative for Bowling Green, on 21 August 1907, for supper, along with a couple of other individuals with prominent Bowling Green names including R.B. Potter from Woodburn, Kentucky, on 9 September 1907, and N.J.M McCormick from Indianapolis, Indiana, on 10 September 1907, who may have both been in town visiting family. 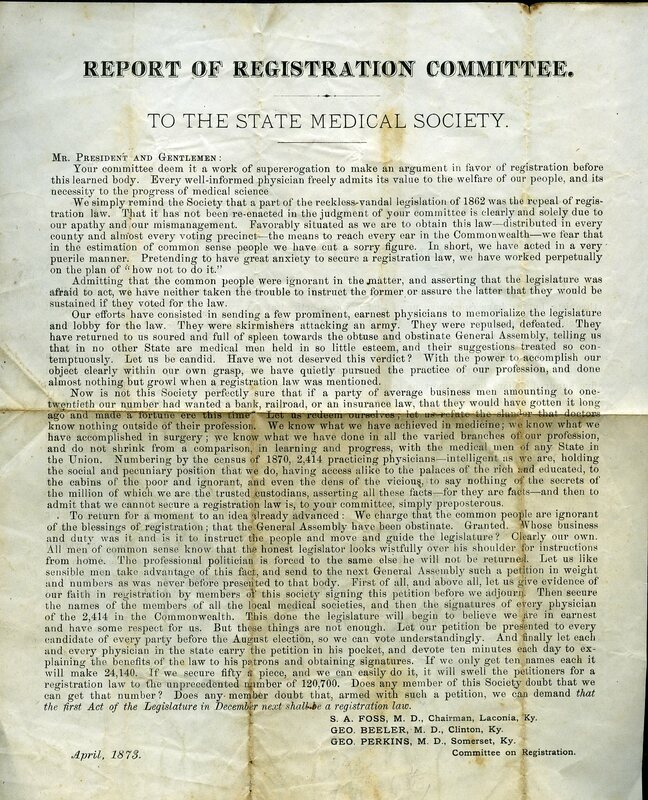 A political climate, very familiar to us today is showcased by certain physicians who tried to deal with the government, but returned, “soured and full of spleen toward the obtuse and obstinate General Assembly.” The doctors also condemned themselves for their low-key approach to the problem noting it was but a growling effort not worthy of such a cause. The flyer calls for renewed efforts by the 2,414 practicing physicians “whose business and duty [is] it to instruct the people and move and guide the legislature.” A call was issued for the physicians to grab every signature of “all who are in office, all who have been in office; all who ever wanted an office and as many of those who never wanted an office as you can get.”! In essence, every person in the state should be approached. Why God himself must have approved of such labors, as it is noted that “an unbroken chain of genealogy [existed] from Adam to Christ.” A little hyperbole in the flyer went a long way and proved successful as the law was passed. Sadly, however, no central office was created to enforce, safeguard or compile the statistics. It would not be until 1910, when the State Board of Health was successful in passing the present law that vital statistics registration was successfully implemented. Birth and death registration was enacted statewide on 1 January 1911, and mostly adhered to by 1920. 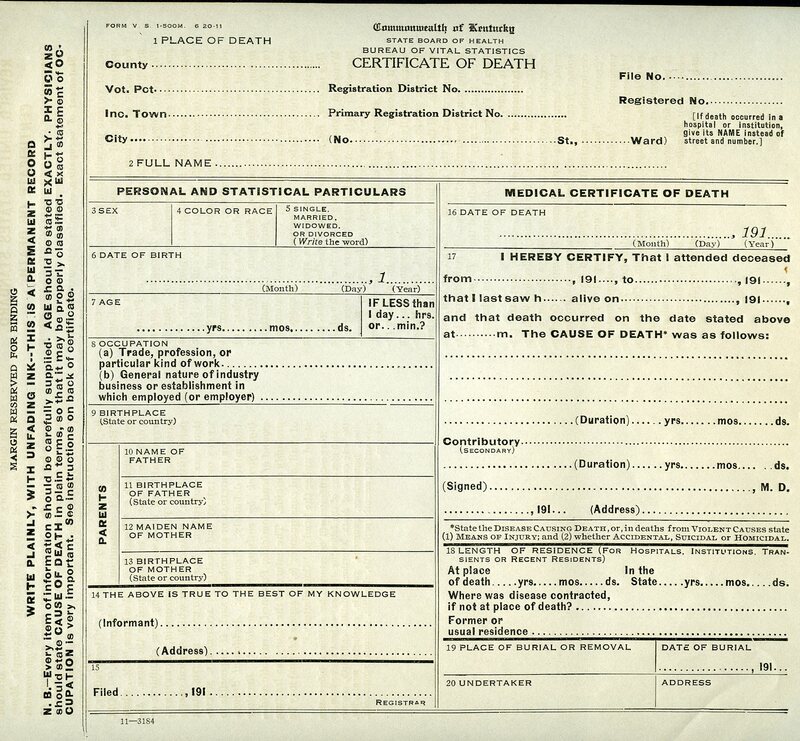 The blank death certificate shows how valuable the information obtained can be for many types of research. See this wonderful flyer and other materials related to medical history in our holdings, visit TopSCHOLAR or browse through KenCat, our searchable database featuring manuscripts, photographs, and other non-book objects housed in the Department of Library Special Collections. Camp Paradise located on Kentucky Lake near the Snipe Creek embankment, Calloway County, Kentucky. 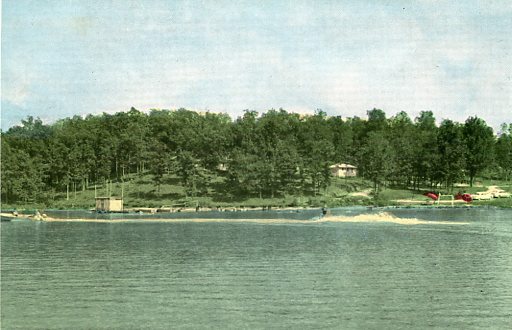 In 1957 Sid & Florence Jobs wrote a prospective visitor to their Camp Paradise on Kentucky Lake that he should call long distance and make reservations, because their eight cottages were in high demand. 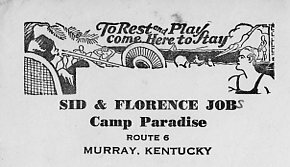 They told the potential guest that his boxer dog was welcome “if there is no danger of him with the children on the premises.” The Jobs also send along a promotional postcard and literature along with several photographs as a way to tempt this vacationer to the place they considered Paradise, three miles from the nearest store or restaurant in Calloway County. By way of accommodations, the Jobs could offer five one-bedroom cottages and three two-bedroom cottages, which were frame buildings clad in shingle tile siding and constructed on cinderblock foundations. The interiors boasted knotty pine paneling, celotex block ceilings and tile floors. Amenities included: tile showers, modern kitchens equipped with refrigerator and gas range, cookware, china, cutlery, linens, electric heating, hot water, and fans. Towels were not included. Guests were encourage to bring any necessary electrical appliances “to make your stay more enjoyable.” Every cottage had an outdoor barbecue pit, picnic table and lawn chairs. The one-bedroom cottages rented for $6 per night or $36 for a week and two-bedrooms rented for $9 per night or $54 per week. At the camp’s dock you could rent a boat for $2 per day or $12 a week, but you had to pay $4 extra per day for a 5 horsepower motor to go with it. Life preservers were thrown in free of charge. Logo on Camp Paradise stationery. The information for this blog post was culled from a small collection of items recently acquired by the Manuscripts unit of Library Special Collections. 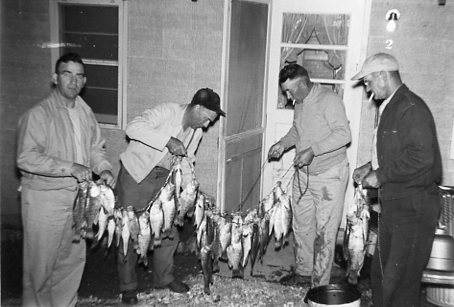 We were excited to learn the camp still exists but is known today as America’s Paradise Resort boasting eleven cottages, five condominiums and a full-scale marina. Modern owners still consider this Paradise. Their website encourages guests to “relax and take in the amazing sunsets for the family and discover why so many refer to our resorts as a ‘little slice of heaven.’” To see the finding aid to our small collection, click here. 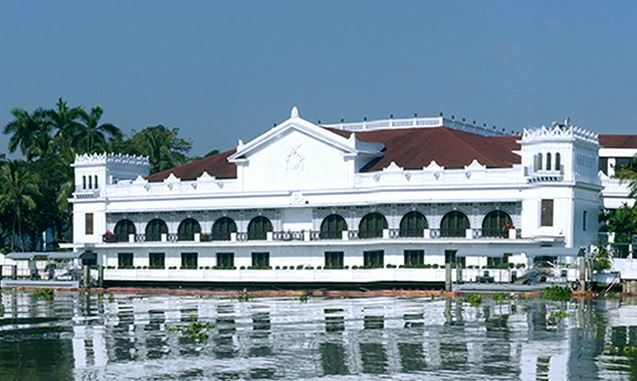 The Malacanan Palace where McElroy spent New Year’s Day in 1909. Governor-General Smith had served with Theodore Roosevelt’s Rough Riders during the Spanish-American War and was part of the first expeditionary force to the Philippines during that same conflict. He later served as an associate justice on the Supreme Court of the Philippines and subsequently on the Taft Commission which was responsible for developing a legal code for the Philippines. William Howard Taft appointed him as Governor-General in 1906, and he served in that capacity until 1909. During this period the Philippine Assembly convened for the first time. Clarence McElroy, one of the most revered members of the Bowling Green bar, kept a detailed account of his trip to the Orient. On this trip he visited the Sandwich Islands (Hawaii), Japan, Hong Kong, China, Ceylon and the Philippines, and he jotted down copious notes about the industrial, economic, and cultural aspects of each country. To learn more about his journal, click here. In addition to these travel journals, Library Special Collections houses over 50 boxes of correspondence and case files related to McElroy; to view the finding aid for this collection click here. A portion of McElroy’s diary is included in an online exhibit titled “Seven Continents” which features travel items found in Library Special Collections. Noah Hancock, a WKU senior from Owensboro, has just completed an internship in Manuscripts, a unit of Library Special Collections. summer internship in the Department of Library Special Collections in the Kentucky Building. This program allowed me to acquire skills and knowledge necessary to carry out tasks, such as organizing documents, reading and transcribing holographic letters, digitizing information, and entering data into TopSCHOLAR and KenCat. Jonathan Jeffrey was very helpful, and he taught me the general processes of how the collections are acquired, accessioned, cataloged, and made accessible to the public both in person and online. For instance, one of the first things I learned was that the items in a collection are arranged in chronological order, which helped me to file and sort documents easier. One of the projects I worked on throughout the summer was a large collection of photocopied Civil War letters, diaries, roll calls, statistics, and records from both the Union and Confederate Armies. There were over twenty boxes filled with vast, indispensable information for research relating to the Civil War. Dr. Kenneth Hafendorfer, Louisville, Kentucky, collected this material when writing his Civil War books. While sorting these documents, I came across some original, personal letters written by certain Civil War soldiers to their respective family members. These letters were dated and had names and locations of where they were stationed. Some letters were short, others were long, with details regarding camp life, troop movements, combat actions, health conditions, and some even requested that items be sent from home. The letters contain information on a variety of subjects that were important many years ago. I found this intriguing, because they provide insight into historic topics, such as the controversy regarding slavery. Moreover, I was assigned the task of reading and typescripting some of the letters, and creating finding aids with summarized descriptions. With Jonathan’s assistance, I uploaded the transcribed documents to TopSCHOLAR. Lastly, I cataloged them into a system called KenCat, the Department’s collection management system. This program allows, the Library to keep track of all documents and materials within the collection. I greatly appreciate Jonathan’s help and mentorship throughout the summer! The internship opened doors for me to experience and explore new possibilities; it also enabled me to use my knowledge and skills. It will no doubt be beneficial in my future career endeavors. Blog post written by DLSC intern Noah Hancock. 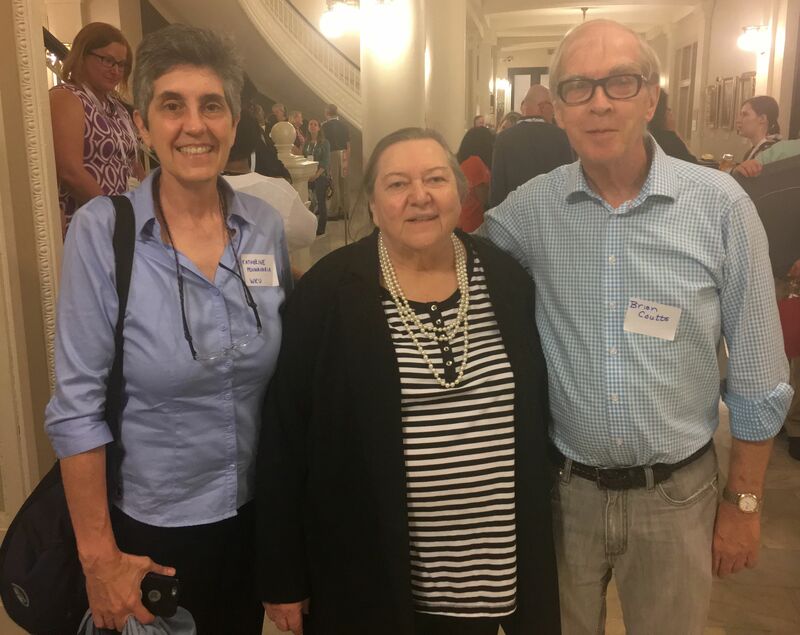 Brian E. Coutts, Rosemary Meszaros and Charles H. Smith, Professors in the Department of Library Public Service retire this summer. 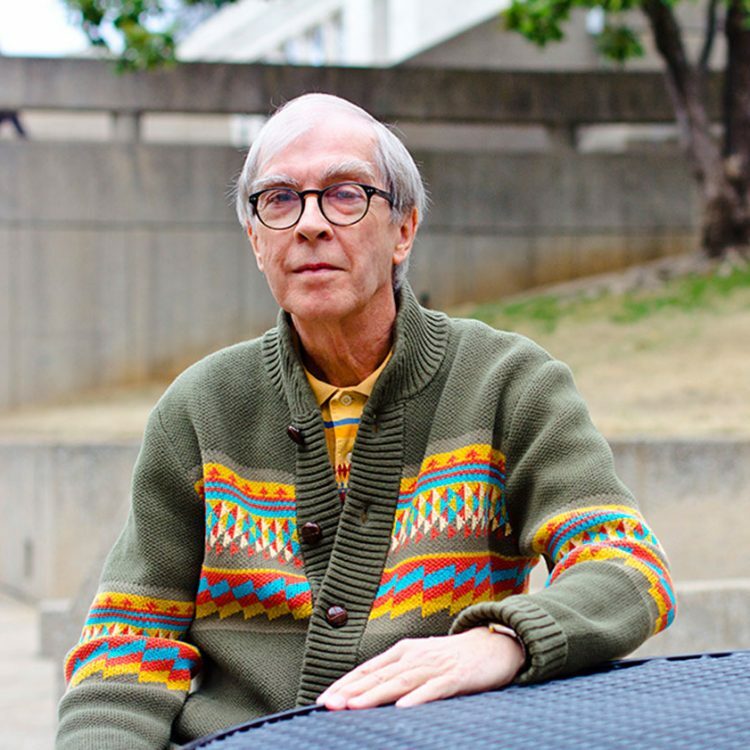 Brian Coutts served as Coordinator of Collection Development from 1986 to 1991 and since 1991 has been Head, Department of Library Public Services. He received the Reference and User Services Association’s highest honor, the Isadore G. Mudge Award in 2017 and is a past winner of the CQ Press Marta Lange Award for Distinguished Law & Political Science Librarianship and the Louis Shores Award for distinguished reviewing. 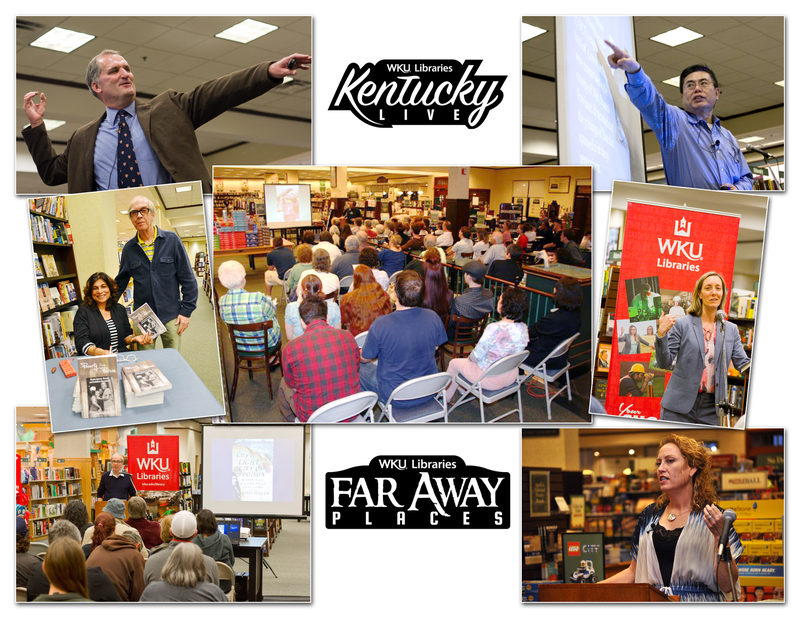 For WKU he served as moderator for more than 200 programs in the WKU Libraries’ Far Away Places Series and Kentucky Live Series and was one of the founders of the Southern Kentucky Bookfest. From 1986-2016 he selected the “Best Reference Sources of the Year” for Library Journal, the nation’s leading trade journal. He serves on the Dartmouth Medal Committee and is a judge for the Benjamin Franklin Awards. “Documents to the People Award” in 2018 and is a past winner of Kentucky’s Academic Librarian of the Year Award. She’s the author of Rising Through the Ranks: Women in War and chapters on government periodicals in numerous editions of Magazines for Libraries. With Katherine Pennavaria she’s been a popular presenter at numerous academic and public libraries around the state on genealogical sources and strategies. She serves on the editorial board of the Journal of Academic Librarianship. 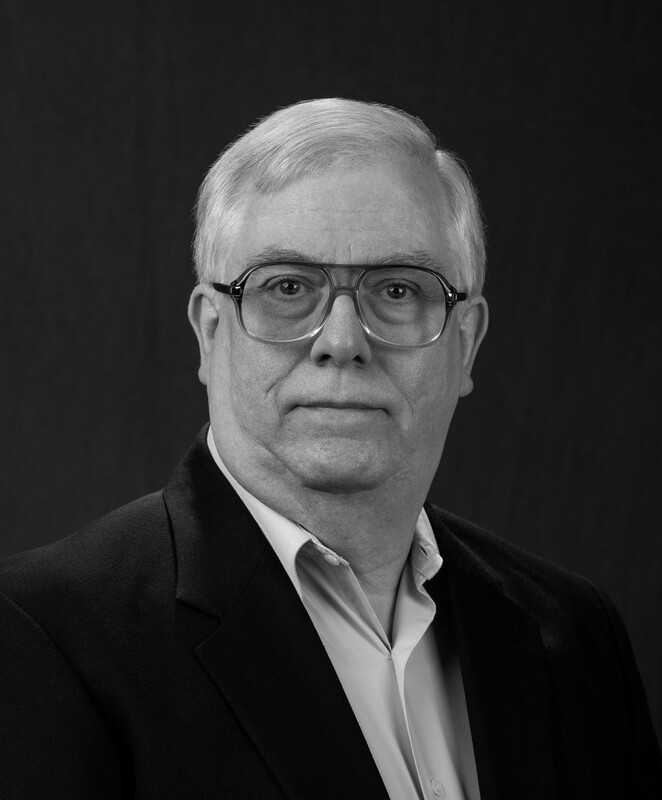 Charles H. Smith joined the DLPS faculty in March of 1995 and has served as Science Librarian and principal liaison to Ogden College of Science and Technology. He’s a past winner of the American Library Association’s Oberly Award for distinguished bibliography and a Presidential Award for Distinguished Public Service. Over the past two decades he has created the Alfred Russel Wallace Page as one of the leading and most widely consulted online sources on one of the world’s most distinguished scientists. One of the world’s leading authorities on Wallace, his many books and articles on Wallace led to his induction into the distinguished Linnaean Society of London. He’s been a featured speaker in Mexico, Brazil, and the UK. His Alfred Russel Wallace Page and his Classical Music Navigator sites are frequently consulted. His newest book on Wallace will be published by the University Press of Chicago in 2018. After more than 200 programs over the past two decades, most held at the Barnes & Noble Bookstore in Bowling Green, our DLPS Series will be ending this spring. 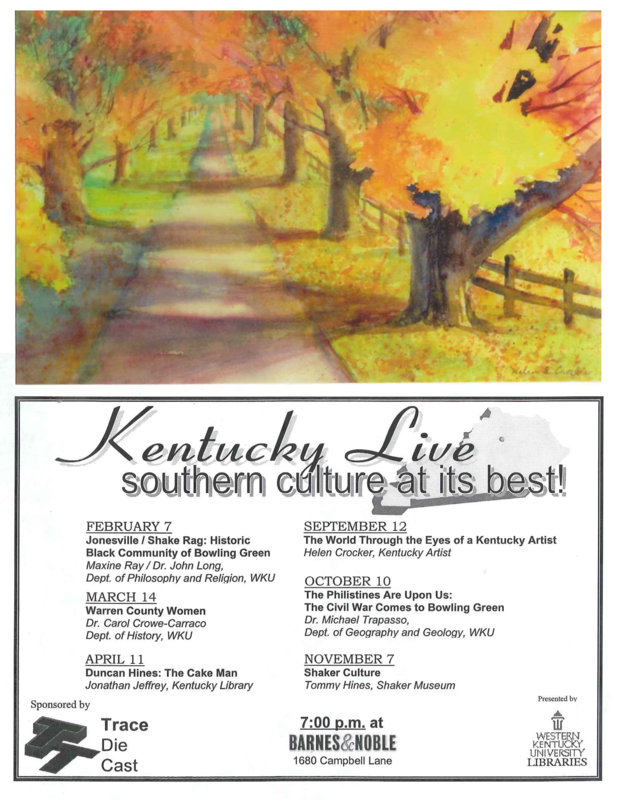 In February, 2003 we launched a companion series “Kentucky Live, southern Culture at Its best!” with a program on Jonesville & Shake Rag: Historic Black Community of Bowling Green from Maxine Ray and Dr. John Long, Department Head of Philosophy & Religion. Programs on photographers, artists, poets, writers, restaurants, historians, bourbon, coal mining, the Derby and virtually every iconic Kentucky product from the Louisville Slugger to Fruit of the Loom Underwear, and the Corvette followed. Our final program this April was from J.D. Wilkes founder of the Legendary Shack Shakers, a Southern Gothic rock and blues band. What a great way to end. None of this would have possible without our genial hosts Barnes & Noble Booksellers. Special thanks to Jennifer Bailey, David Hollifield and before them Natalie Boddeker and David Coverdale and all of your fine staff for setting up all those chairs and ordering all those books and helping us promote these programs. Thanks also to Dr. Richard Weigel, Professor of History who edits the Book Page for the Bowling Green Daily News for running so many reviews of books from our featured speakers. The attention you focused on many regional authors was very much appreciated by them and by us. David Keeling, Michael Trapasso, John Dizgun and Haiwang Yuan, and so any others from around the country and beyond—world travelers all—thanks for so many exciting evenings. To our sponsors Coca Cola, Trace Die Cast, Integra Bank and the Friends of WKU Libraries—we appreciated your interest and support. To former Deans of WKU Libraries Mike Binder and Connie Foster—thanks for your interest and support. Finally—thanks to our series team over two decades—Peggy Wright, Bryan Carson, Haiwang Yuan, Daniel Peach, Eric Fisher, Ryan Dowell, Shaden Melky, Jennifer Wilson, Christopher McConnell and a host of talented DLPS Office Assistants and Students. 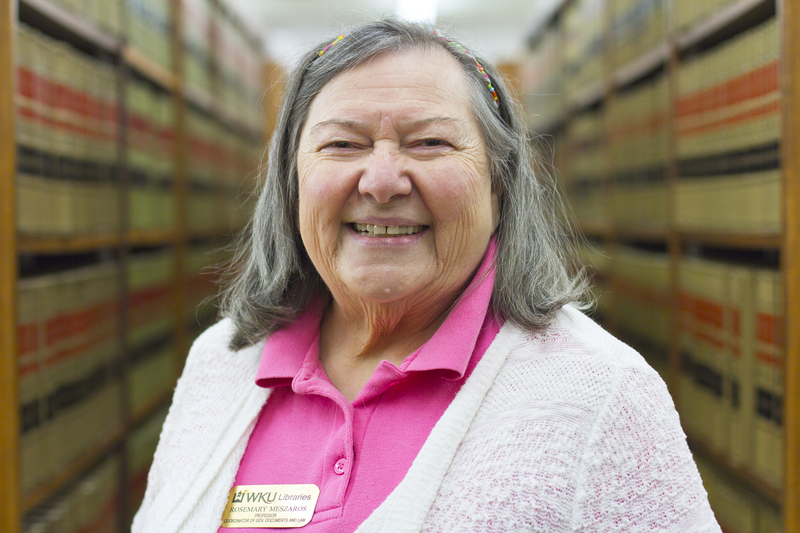 Rosemary Meszaros, Professor and Coordinator of Government Information and Law, in the Department of Library Public Services at WKU since 1998 was honored on Sunday, June 24, 2018 with one of the American Library Association’s, Government Documents Round Table’s highest honors, the ProQuest/GODORT/ALA “Documents to the People” Award. The award which consists of a cash prize of $3,000 goes to an individual, institution or library that has most effectively encouraged the use of government documents in support of library service. 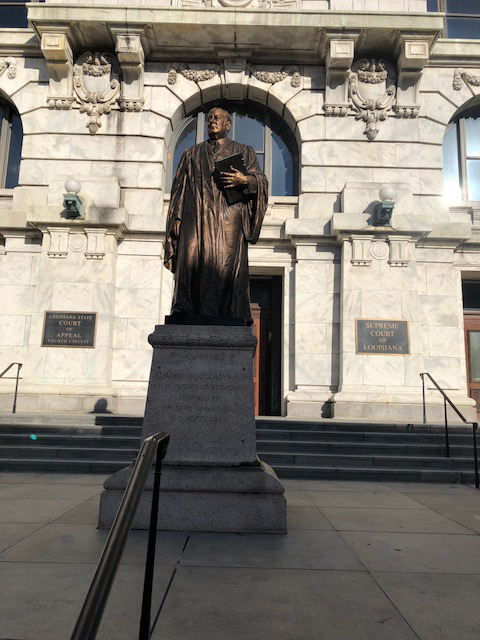 A reception was held at the Louisiana Supreme Court Building, 400 Royal Street, in New Orleans, Louisiana. Rosemary received her MLS from LSU’s School of Library and Information science and an MA in history from California State University, Dominguez Hills. Prior to coming to WKU she worked at Boston University and the University of California at Santa Barbara. In 2015 the Federal Depository Library for the Second Congressional District of Kentucky celebrated its 80th Anniversary. Western Kentucky University’s Manuscripts and Folklife Archives, a part of the Department of Library Special Collections, was recently granted accreditation status by the Kentucky Oral History Commission (KOHC). Archives that receive accreditation serve as “permanent repositories for oral history collections, which KOHC sponsors through grant awarded funds.” With its newly appointed status, the Folklife Archives joins a group of state-recognized institutions dedicated to the long-term care, preservation, and maintenance of regionally-specific oral history projects. These projects, conducted by professional and amateur researchers, highlight the nuanced and complex issues surrounding community, identity, heritage, and tradition throughout the commonwealth. Accreditation is granted for a five-year period, after which the institution must re-apply. 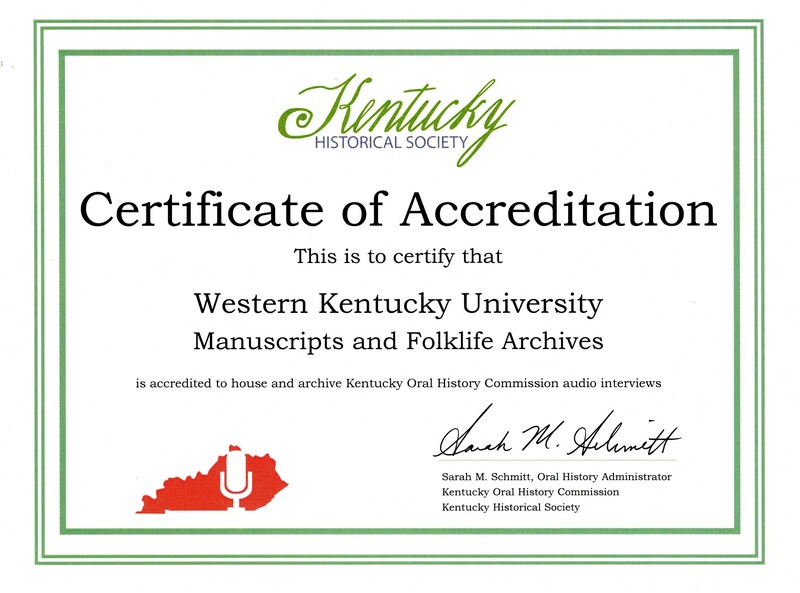 The accreditation certificate issued to Manuscripts & Folklife Archives by the Kentucky Oral History Commission. “Having accredited repositories available throughout the Commonwealth is an important asset to the Kentucky Oral History Commission (KOHC). Preservation and statewide access are two of our keystone values, and WKU is now our western-most accredited institution. 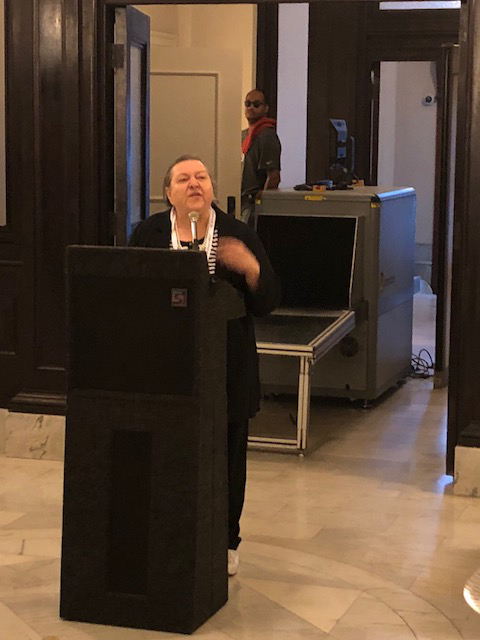 The KOHC has enjoyed a long and happy relationship with Western Kentucky University, and this distinction will only strengthen it,” said Sarah Schmitt, current Oral History Manager at the Kentucky Historical Society. The application process, which was completed over the span of several months by Jonathan Jeffrey, the Department Head of Library Special Collections, and Delainey Bowers, a graduate student in the Folk Studies program, emphasized the Folklife Archives’ commitment to creating a repository, both as a physical space and as an online environment that values progressive storage policies and practices. 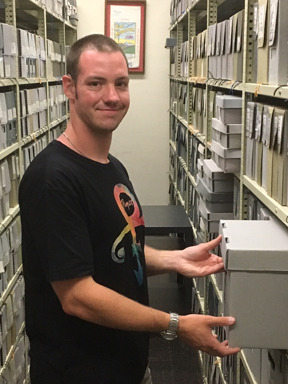 With more than 5,000 audio recordings in analog form—including oral histories on reel-to-reel audiotapes and cassettes, as well as born-digital materials—the Archives places an importance on making collections available and easily accessible to the public. Through the use of online platforms, such as WKU’s TopSCHOLAR and Pass the Word, a KOHC-sponsored discovery tool geared towards oral history collections throughout the state of Kentucky, the Folklife Archives continues to prioritize recorded content in progressive and meaningful ways. “I’m pleased that we have attained accreditation and met the standards set by KOHC’s progressive leadership. Kentucky has long boasted one of the country’s finest oral history programs. WKU’s Folk Studies and Anthropology and History departments have helped us amass a significant collection of audio material that document the Commonwealth’s folklore and history,” said Department Head Jonathan Jeffrey. Significant aid for this project came from former Folk Studies and Anthropology Department Head, Dr. Michael Ann Williams, current Folk Studies Director, Dr. Ann Ferrell, Director of the Kentucky Museum and Kentucky Folklife Program, Brent Bjorkman, Dean of Libraries, Susann DeVries, Library Systems Office Coordinator, Michael Moore, Provost, David Lee, and the Potter College of Arts and Letters. WKU’s Department of Library Special Collections, housed in the Kentucky Building, has been collecting material related to the history and culture of Kentucky since the late-1920s. The Department has three units: the Kentucky Library, Manuscripts & Folklife Archives, and WKU Archives. Bettin’ on the ponies ain’t no easy task, but former folk studies students Robert Sherman and William Adams may have cracked the code. In their 1972 paper titled “Kentucky Horseracing and Horse-Betting: Various Gambling Patterns and Techniques of the Kentucky Horseracing Community,” Sherman and Adams hoofed it to Churchill Downs on Opening Day to learn the ins-and-outs of wagering, handicapping, and risking it all for sweet taste of victory. Whether betting across the board, eyeballing a Daily Double, or keeping your fingers crossed for a win, place, show, playing the ponies is a beacon of light for casual bettors and professional gamblers alike. Sherman and Adams’ subjects divulged their reasons for hitting the tracks, which ranged from hopes of financial gain to enjoying a simple recreational pastime, but all agreed that horse-betting—an art form in and of itself—requires patience, dedication, and a small touch of luck. Jim Ray, a native Kentuckian, is a believer in the power of lucky numbers. Writes Sherman, “He told us that he selects the horse according to the last digit in the weight that horse carries. If the weight of the horse is 118 pounds, then he would bet on the 8th horse listed.” Ray admits that his technique is a little unusual, but the cash in his wallet speaks for itself. Intuition exists for a reason, or at least Martha Bangston believes it does. Bangston keeps her system simple, an amateur approach that favors the odds without running against any longshots. Sherman explains it as, “There are usually nine races on a daily card. [Bangston] breaks these down into three groups of three races each. In the first race of each group, she bets the horse with the best odds on the program. In the second race, she bets the horse with the second best odds and so on.” Her success rates with this method are high, and that’s all that matters, isn’t it? Lorene Budd, a cautious gambler at best, factors in the horse’s name when placing her bets. “A horse that has a name similar to one of her friends or relatives is the one that she selects,” writes Sherman. So if you have an uncle’s whose name sounds similar to Firenze Fire (and don’t we all? ), or a bestie named Magnum Moon, you’d better start the drive up to Louisville. 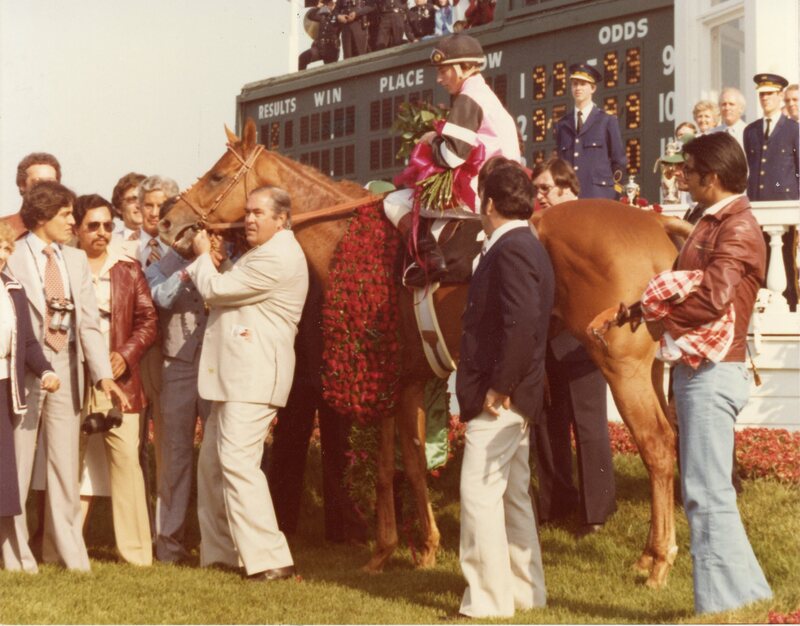 For more information on the Kentucky Derby, racetrack betting, or jockey lore, visit TopSCHOLAR or browse through KenCat, a searchable database featuring manuscripts, photographs and other non-book objects housed in the Department of Library Special Collections!